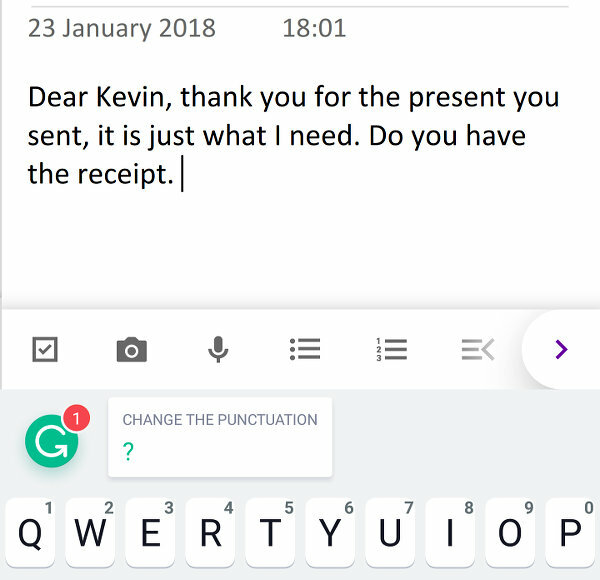 Whether you have an Apple iPhone or an Android phone, you will find the Grammarly keyboard in the store app on your phone. Open the Apple App Store or Google Play Store depending on your phone and search for ‘Grammarly’. Install the app and run it. It will walk you through setting it as the default keyboard. 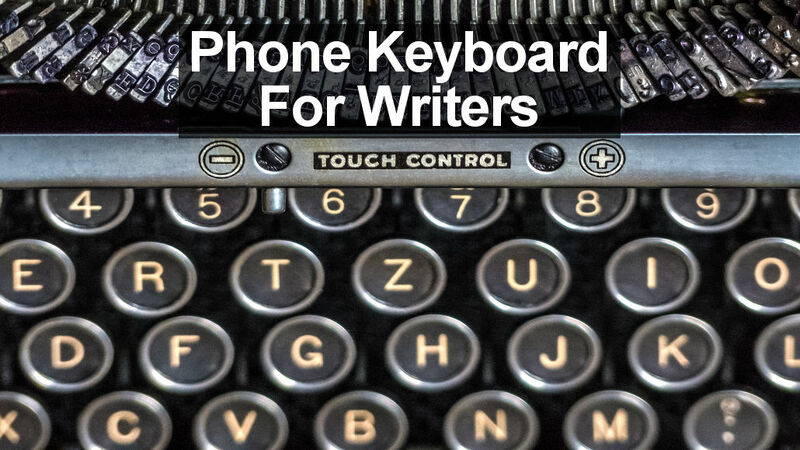 I ran it on an Android phone, but the iPhone keyboard is very similar and you can switch keyboards from within the Grammarly keyboard or by opening the Settings app. On Android for example, go to Settings > General Management > Language and input > Virtual Keyboard. On the iPhone go to Settings > General > Keyboard > Keyboards. Grammarly is a website that enables writers to check the spelling and grammar of their writing. You can copy and paste text into the Grammarly editor and it scans it and highlights problems so that you can fix them. It also suggests corrections if you have used words in the wrong way. The Grammarly Keyboard does the same thing, but on the fly as you type. 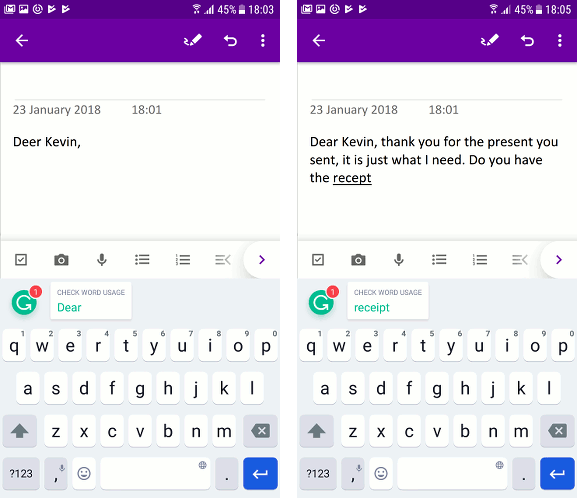 The standard keyboard built into a phone has predictive text that can fix typing errors and spelling mistakes, but Grammarly Keyboard goes further. Take a look at this for example. I started this note with ‘Deer Kevin’. There are no spelling errors, but Grammarly instantly spotted the mistake and suggests ‘Dear’ instead of ‘Deer’. It understands how language should be used and not simply how it is spelt. Tapping the suggestion replaces the word. It was hard to get a screenshot of a spelling mistake because it kept automatically correcting them as soon as they were typed. It does not simply suggest corrections as a phone’s auto-correct usually does, it actually corrects errors as you type. Tapping the suggestion replaces the word. Here is another example. This time I typed ‘Do you have the receipt.’ There are no typing errors, so a normal keyboard would not suggest anything. However, Grammarly correctly detected that a question has been asked and suggests changing the punctuation to a question mark. There are a few extras and long pressing the full stop (period) key displays a useful collection of symbols. You can slide your finger over them to select them instead of switching keyboard displays and hunting for the symbols. Long press on the spacebar and you can change keyboards. There is an emoji button for selecting smiley faces and all the other wacky characters. In the app settings you can enable/disable auto-correction and auto-capitalisation of the first word of a sentence. A double space can be used to end a sentence and it adds a period and space. Keys can vibrate when pressed and make a sound if you prefer. If you look carefully at the screenshots, you will see that the top row of letters also has numbers. There is no need to switch to the numeric keyboard to enter numbers and long pressing the top row letters enters the number on them. I have tried several keyboards on my phone, but I have always switched back to the built in. Grammarly Keyboard is probably the first one that I will keep. I like the way it automatically corrects typing slips and spelling mistakes, and how it suggests fixes to grammar errors. The only minor irritation is the size. The Grammarly bar above the keyboard adds to the size and the keyboard takes up more screen space that some others. I can live with that though. An advertisement for a special keyboard popped up today on Facebook. The name, Grammarly. It explained it’s features,etc. I’ve been having tough times, always, with all of my words connecting for quite a while, and quite a few keyboards. Today..downloaded Grammarly!! So far it has solved all of my texting problems..and more!! I highly recommend! But I can’t find a way for it to show predictive spellings of words that my built-in keyboard has. In other words there’s a line at the top and if I start to type to, then the predictive type will give me the choice of the entire word tomorrow. Maybe you just need to use it for longer. Keyboards remember commonly typed words and then start suggesting them after a while. I use predictive text for appointments, same property different people. How can I get predictive text so don’t have to text the same thing over and over, hope that makes sense….